Ask fellow campers about "Fiddler's Cove RV Park (Military FamCamp)" and nearby attractions. Love this park. 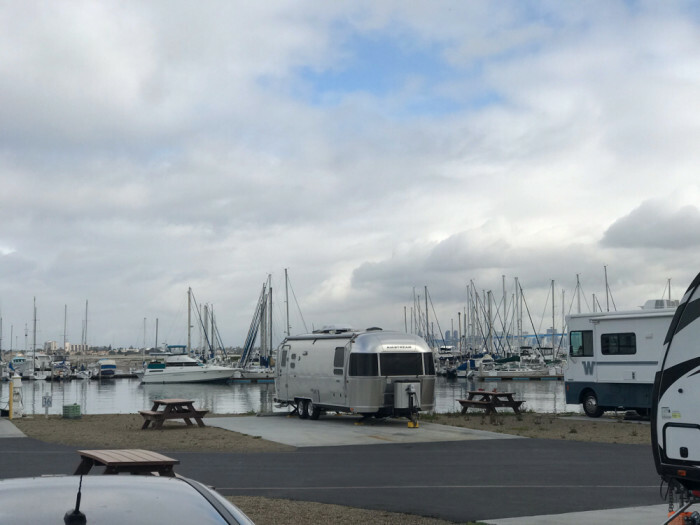 Small, quiet and right on the marina! We spent the weekend in Imperial Beach and enjoyed the beach and bars!!! 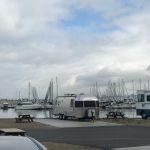 We camped at Fiddler's Cove RV Park (Military FamCamp) in a Travel Trailer. Great price for this location! Convenient to most of the San Diego tourist attractions (up to 1/2 an hour to the waterfront boat tours, etc. because of traffic). Level concrete pads, friendly and helpful desk attendants, good cable (but spotty T-Mobile and park Wi-Fi). Some occasional helicopter noise, but not often enough to be a problem. Wicked speed bumps! We camped at Fiddler's Cove RV Park (Military FamCamp) in a Motorhome. The nearby SEAL base has a good MWR office (limited hours), nice gym, and movie theater. Larger NEX and commissary are available at the Air Station on the north end of the island. For a great seafood meal at a reasonable price, try Pete's Seafood at 3383 30th street, about 5 miles east (park in the rear). Great location. Pricey for a famcamp, but given the location, understandable. Customer service is friendly but inept. Questions are met with stares and shrugs. Sites are modern, utilities in good condition. Lots of cable channels, wifi and cell work well. Great bike path runs right by the park. Sites are nice and wide. While they are not very private (the place is a big parking lot, no landscaping at all), at least you aren't camped on top of your neighbors. The waterfront sites are back in. Hence, for motorhomes, the pull through sites in the middle row are better for a nice view than the sites next to the water. Because there's so much space between sites and the rows are offset, the middle sites have a great view of the water and San Diego. Doesn't look like there's a level site in the whole park. Slightly difficult to navigate through, but it was because of people's tow cars parked outside the limits of their sites. Lots of kids, very noisy. Also, there are giant speed bumps throughout the park. They weren't that bad to drive over if you just went slow, but people would speed over them and every time a car went by, there was a big banging sound as they went over the speed bumps. There was a bad odor off the water one day of my stay, but I didn't notice it the other days. We camped at Fiddler's Cove RV Park (Military FamCamp) in a Motorhome. The park is not located on base but is a short drive to the north base or 32nd street. Sites are level concrete and fairly long, but our 42' 5th wheel just fit and left enough room to park the truck in front. Some sites are water front. A marina is adjacent to the park and offers watercraft for rent. No swimming is allowed and the water/beach area is pretty nasty. Free cable, wi-fi and picnic table. There is a terrible smell everyday at low tide. Great bike path goes right by the park and the town of Coronado has many restaurants and shops. Nice public beaches are just a short drive away. This park is very popular so reservation are a must. Be sure to see Hotel Del Coronado, USS Midway and the seals at La Jolla Cove. We camped at Fiddler's Cove RV Park (Military FamCamp) in a Fifth Wheel. This is the first time we have stayed here since the Park was renovated. All we can say is WOW! With one exception they did a top notch job. That exception regards the waterfront sites. They are all back in sites, great if you are in a trailer, but not so good if you are in a Class A or C. If you are in a Class A or C and decide to drive in, you will need to have power, water, and antenna cable long enough to run from your utility closet to the power and water pedestal. We have found the staff helpful and friendly. Great views, close to all the San Diego attractions, in the middle of Navy Seal training grounds...so you get to observe some pretty nifty stuff! Cable TV and WiFi worked great--no problems whatsoever. We will definitely stay here again. We camped at Fiddler's Cove RV Park (Military FamCamp) in a Motorhome. The hookups all worked well. The wifi was excellent (when it worked). The campground is on the San Duego Bay. The sites are concrete pad with a picnic table. Only water front sites are allowed fires. The staff is only there to collect money. Don't expect anything useful in advice or help from those ladies. $35 for a military campsite is high. We camped at Fiddler's Cove RV Park (Military FamCamp) in a Fifth Wheel. Great park the spaces are larger than most and easy to get into. The staff is helpful lots of kids which we do not mind. The pads are level and large we put out our slides and awning and had room to park our car. We camped at Fiddler's Cove RV Park (Military FamCamp) in a Motorhome. It is on the Bay so while the view is great swimming is like being in a big saltwater pool. It is a good place to just kickback and relax and it is in San Diego where there are a ton of things to do. Easy launching for water toys. Can rent boat including sailboats but you must have experience to rent sailboats. This park has been recently renovated and is now a top-notch RV park. All sites have 50 amp full hook-ups and level, concrete pads. There is plenty of space between sites but no trees. The view is of the marina and the bay and the waterfront are literally 10 feet from the water. Coronado, a few miles north, has lots of excellent shops and galleries and many high-end restaurants. It's a great place to spend some time, with easy access to the entire San Diego area. We'll be back. We camped at Fiddler's Cove RV Park (Military FamCamp) in a Motorhome. 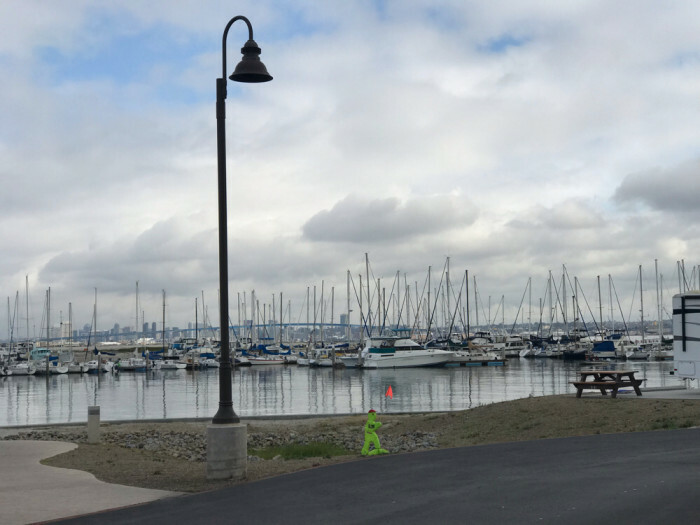 Waterfront sites, close to the Hotel Del Coronado, bike and boat rentals on site, new level concrete pads, clean restrooms & showers, but spotty internet access though. We camped at Fiddler's Cove RV Park (Military FamCamp) in a Travel Trailer. Great park that's well worth the price. It is new so how it is in a couple of year's we'll have to see. Weekends getting very busy, but weekdays no problem. We will be back whenever in SD! We camped at Fiddler's Cove RV Park (Military FamCamp) in a Motorhome. Nice location. Nice views. Pricey for a military campground. Pictures imply coaches can pull nose in to bay views. Better have power, water and sewer extensions. Bay views were designed for fifth wheels and trailers with that picture window in back. Gravel, concrete, and sand to seawall. Not made for swimming. Most rules restrictive park we've used. Yet, it seemed they were selective on which rules (allowed tents and non-commercially built trailers to use camp sites). I don't have a problem with that, but it was against the rules. Now the bad. The staff was "abrupt". When I commented to manager about it, the response was, "...well. you have to understand that she..." Next, do not show up before 1300 and expect to go to your site if it is open. Check in is at 1400, which they'll be very happy to tell you. You'll have to argue successfully to wash the bugs off the front of your coach but no hose rinse. Don't waste your money on fire pits. They are 30-40 ft away from a place that might be usable near your coach and are located on a 25 degree slope down to the sea wall. Dog park is nice, but is located 1/2 mi away. You cannot access the beach across the road. It is closed for military maneuvers all the time. Gates from housing area left open and bikes were stolen while we were there. There were non-military people using the park. We will not return. We camped at Fiddler's Cove RV Park (Military FamCamp) in a Motorhome. We stayed with friends here because he is retired military reserve. They are allowed one guest. Our rate was $18 as a visitor and the military rate was $12. Your location with the bay, Coronado bridge, naval ships and the Pacific Ocean just across the Strand is excellent. The bike path into Coronado and to Imperial Beach is very good and convenient. As this campground is under construction every site is dry camping with easy access. It will be interesting to see what it looks like when they finish building full hook-ups. Obviously you will listen to generators quite often but you have to expect that under the circumstances. We camped at Fiddler's Cove RV Park (Military FamCamp) in a Motorhome. This Park is still not funded. Now all sites are dry camping. There is a dump station. We camped at Fiddler's Cove RV Park (Military FamCamp) in a Motorhome. We stayed here 7 nights the week of 18 Feb 2007. This is a Navy run MWR park that is only available to military and DoD civilians and Coast Guard. Qualified persons CAN sponsor a non-military guest rig. The greatest thing this park has going for it is its location. Coronado, San Diego, Tijuana Mexico, Sea World, the ocean and the San Diego Zoo are all easily accessible. So, the park gets a top rating for location. From there, the campground itself struggles. Campground Pro’s: Location; nice marina and boat rentals available; small store; gated entrance, kid friendly. Campground Con’s: Very narrow sites; no sewer hook-ups; bathrooms are not clean – this is also a Marina and everybody uses the same bath and latrine facilities and it shows; limited recreational facilities beyond boats on site; no organized activities such as cards or crafts; first come/first served policy selectively adhered to regarding sites; NO WIFI access without paying $4/hr ( and then it’s very slow). As a retiree with 30 years service, I look at MWR as our club membership, yet, I’m not seeing the value. 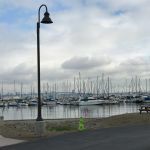 When we come to San Diego in the future, we will opt to use our regular campground membership and stay elsewhere in the near-by area at a park with the amenities we like, surprisingly at a fraction of the cost of Fiddler’s Cove. I guess we’re spoiled and we’ll vote with our boots. The Navy has not gotten it right. I’d suggest they send a staff person to Davis-Monthan AFB in Tucson to learn from those who do have it right. As stated, the Park has a perfect location and if you’re only using it for a base of operations for a short period, you’ll be satisfied. The Park at San Onefre would be a better choice, park wise. This Park is scheduled to close September 2007 for 4 months (or more) for a total reconstruction. This should solve some of the physical site deficiencies. It’s a GREAT opportunity to get it right! An earlier reviewer noted that they would stay in the dry sites on future visits. If you have a generator and sufficient water, there’s wisdom in this thinking. After 2 nights in the partial hookup area, we moved to the dry area and were somewhat happier. This time next year the facilities issues should be a mute point. Finally, to avoid a potentially thrilling trip over the bay bridge into Coronado, I’d suggest coming up highway 75 from the south (exit 5A off of I-5) through Imperial Beach. You’ll avoid the high winds on the bridge and snaking through the narrow highway and traffic in Coronado to get to the Park. I hope this review helps. We camped at Fiddler's Cove RV Park (Military FamCamp) in a Fifth Wheel. Beautiful view of San Diego Bay! RV and camp sites are located right along the water. Lots of family water events to enjoy, including sailing, canoeing and kayaking. Bring your bikes and enjoy the nice biking trails up and down the strand. There are a lot of nice shops and restaurants within easy biking distance. Facilities have always been clean and neat (shower, bathrooms, laundry room, etc.) every time we have visited. This RV park is located off-base and is open to active duty, retirees, DoD civilians and civilian guests without ID's when accompanied by an eligible sponsor. We camped at Fiddler's Cove RV Park (Military FamCamp) in a Motorhome. Are you affiliated with Fiddler's Cove RV Park (Military FamCamp) ?